An Arabic letter handwritten by Father Khouri Nematallah al-Hasibany on December 18, 1914. It confirms the birthdate of Naeem Faris on January 1, 1899. The letterhead is from St. Joseph's Maronite Church in Ayn Zibdy, Syria. A photograph of Mary Farris as a young woman, sitting on a stone bench in front of a painted wall. A photograph of a young Mary Farris (center) with two unidentified friends. Though undated, the photograph was likely taken in the 1920s in Vicksburg, MI. A photograph of Abe and Zelpha Farris and their daughter, Mary, standing outside in front of a stone wall. Caption from donor: "Abe Farris, Jim Angelo’s grandfather." The photograph depicts Farris standing on a sidewalk in front of a deli, an American flag in the foreground. Presumably taken in Vicksburg, Mississippi. A typed document written by one of Alma Farris' grandchildren, Lee Anne. It contains some of her childhood memories of spending time with her "Sitho" (grandmother) in Elizabethtown, North Carolina. A typed document written by one of Alma Farris' grandchildren, Kathryn. It contains some of her childhood memories of spending time with her "Sitho" (grandmother) in Elizabethtown, North Carolina. A birthday letter from the Diocese of Raleigh written to Alma Farris on the occasion of her 90th birthday. The letter includes a prayer and an acknowledgement of Alma's contributions to the Our Lady of the Snows church in Elizabethtown. A color photograph of Helen Parker (middle) surrounded by her children: (in no order) Louis, Alma, Agnes, Lillian, and Magdalen. Though undated, the photograph may have been taken in the 1970s. An article published in The Bladen Journal announcing the retirement of Alma Parker Farris and the closing of the Farris Department Store. The article contains a photograph of Alma and a description of her impact on Elizabethtown. 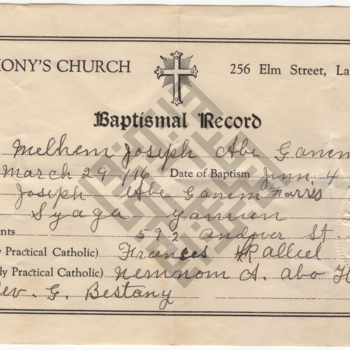 A scan of Alma Parker's birth certificate. Alma was born on January 31, 1917 and the certificate was issued on August 7, 1975 in Edgecombe County. A portrait of five unidentified girls, ranging in age from childhood to adolescence. The girls are likely members of the Parker family or related to them in some manner; perhaps grandchildren of Sam and Helen Parker. A portrait of five unidentified boys, ranging in age from childhood to adolescence. The boys are likely members of the Parker family or related to them in some manner; perhaps grandchildren of Sam and Helen Parker. A newspaper article announcing the impeding wedding of Alma Parker to Shikrallah Farris.